يشكل فندق Breakfree Royal Harbour Hotel بموقعه الممتاز في منطقة سياحة, مطاعم, شواطئ ضمن مدينة كيرنز، مكاناً ملائماً لقضاء العطلة بعيداً عن عجقة أيام العمل. لا يبعد الفندق كثيراً عن مركز المدينة، فهو يقع على بعد 1 km منها. في حين يستغرق الطريق منها إلى المطار حوالي 20 دقيقة. يشكل هذا الفندق ملاذاَ مريحاً للاسترخاء ويمنح زواره فرصة للاستجمام والتجدد، وهو يقع على بعد خطوات من المعالم السياحية الكثيرة للمدينة كمثل: Michael Seebeck Gallery, WetRez, كايرنز ريجنال. يقدم Breakfree Royal Harbour Hotel خدمات لا غبار عليها وكل أشكال اللياقة وحسن الضيافة اللازمة لإسعاد ضيوفه. يقدم الفندق تسجيل وصول/خروج سريع, تخزين الأمتعة, واي فاي في المناطق العامة, صف السيارات, غرفة عائلية لضمان الراحة القصوى لضيوفه. بالإضافة لهذا,تتضمن كل غرف الضيوف مجموعة واسعة من وسائل الراحة . بعض الغرف توفر حتى حوض الاسترخاء, غرف لغير المدخنين, مكيف هواء, شرفة/ تراس, ساعة منبه لإرضاء أكثر الضيوف تطلباً. يقدم الفندق مجموعة واسعة من وسائل الراحة المتنوعة، كمثل: مركز للياقة البدنية, مسار جولف - ضمن 3 كم, حمام سباحة خارجي, حديقة, رياضات مائية (غير آلية). يحظى فندق Breakfree Royal Harbour Hotel بموقع ممتاز وخدمات يصعب منافستها. ساعات عمل مكتب الاستقبال في هذا العقار من الساعة 8:00 صباحًا إلى الساعة 6:00 مساءً كل يوم. وإذا وقعت ساعة تسجيل وصولك خارج هذه الأوقات، يرجى الاتصال بالعقار قبل الوصول بيومٍ واحد على الأقل. يجب على النزلاء الذين يصلون بالسيارة أو التاكسي أن تدخل المركبة عبر طريق مدخل العقار الخلفي في طابق 1 شارع 60 ابوت فوق الأسواق الليلية، حيث توجد الاستقبال وموقف للسيارات. love staying here. We stayed for our Wedding Anniversary and it always delights us both. Love the spa and the spacious apartment. Right in the centre of town. Can't ask for anything else. Will be back for next anniversary, if not before. Recommended on price and location. Apartments are sufficient for a short stay. We were luck enough to book the ocean view apartment at the commencement of the Commonwealth Games - plenty of entertainment on the Esplande. Short walk to everything Cairns. The apartment is a little dated but had a traditional feel at the same time. Worth a book. Fantastic place to stay , rooms are spacious and clean , Pool and gardens were beautiful . Staff were outstanding. Location is perfect , food and bars everywhere. Very happy customer who will return . Great location right in front of the lagoon on top of the night market. Most room have an awesome view providing you’re just high enough to see past the tree tops of the esplanade. Great staff very helpful in accomodating my multiple bookings. Good value for a self catered one bedroom apartment in this location. You only have somebody clean your room if you stay over 8 days. No fresh towels, no trash cleaned. Reception is only open between 8-6, so if you arrive after 6.. good luck! They have 2 different entrances and they do not give you any info before you arrive. I spent 30 min with my bags walking around trying to figure out. Apartment is very basic, ocean view is not really a view.. is like a corner view. Would not stay there again. Good location, with partial sea view, good size, 5 minutes walk to pier and big supermarket across the road. Booking agent on site. Reception staff on site from 08:00 - 18:00 only. One stove in kitchenette, means slow and smoke alarm super intimidating. Failing to set off false fire alarm in one minute will result in turnout of fire service and a charge of A$1,000 will be levied. Lo cleaning service during the five days of stay. This is a great place to stay in the middle of the action. Perfect location, a short walk to everything you need. Friendly staff. Nice rooms but they are a little dated. We had a great view from the 6th floor. Unfortunately, Wifi is not included which is a little ridiculous considering how much you pay for hotels in Australia. We will stay here again next time we're in Cairns. Cute and clean motel. Nicely situated on the waterfront. Clean and baiting. Washing machine in room; dryer available at another part of the motel. Very convenient. Got to was the Cairnes bats from our balcony. What a site at sunset. The location is good, just above the night market. The mattresses is not hard enough, we can't slept well. Cleaning service is available for staying 8 nights. As we only stayed for 7 nights, no cleaning service was provided. The manual of the washing machine was missing. It would be much better if some condiment could be provided for cooking. You don't need car, you can walk everywhere! The staff were so friendly and helpful. The view from the seventh floor was fabulous over the ocean, the mountains and over the Lagoon. Could sit there for hours watching the world go by. Great little kitchen and the circle spa was a real treat! Comfy and huge bed too. We will definitely be back! Great place to stay. Clean and tidy. A little on the older side of decor but very comfortable. Walk out the door and your in the middle of it. Shops restaurants bars coffee casino just down the road. Next time I'm in Cairns I know where I'll be staying. We found our room spotlessly clean, very comfortable and lots of useful storage space. We had a one bedroom apartment for a week and had no problems with anything. Reception staff were extremely helpful with just about anything and are a credit to the company. Would most certainly recommend this to anyone who wants a clean, comfortable apartment with no frills and excellent position and service. We will not stay anywhere else in Cairns again. This was our second stay here. And like last time it lived up to our expectations. 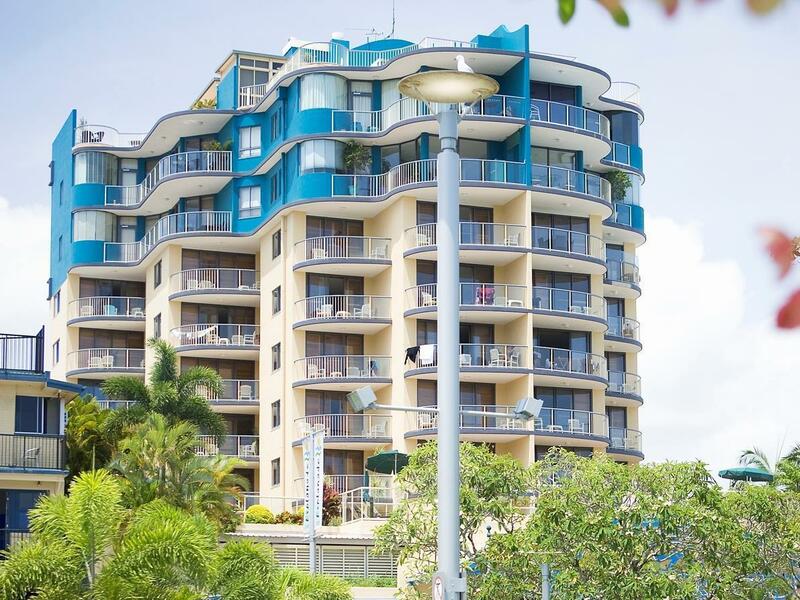 The hotel is clean and the staff friendly and helpful....when we return to Cairns we would not hesitate to book this hotel again. We had 7 days staying here in May 2015. 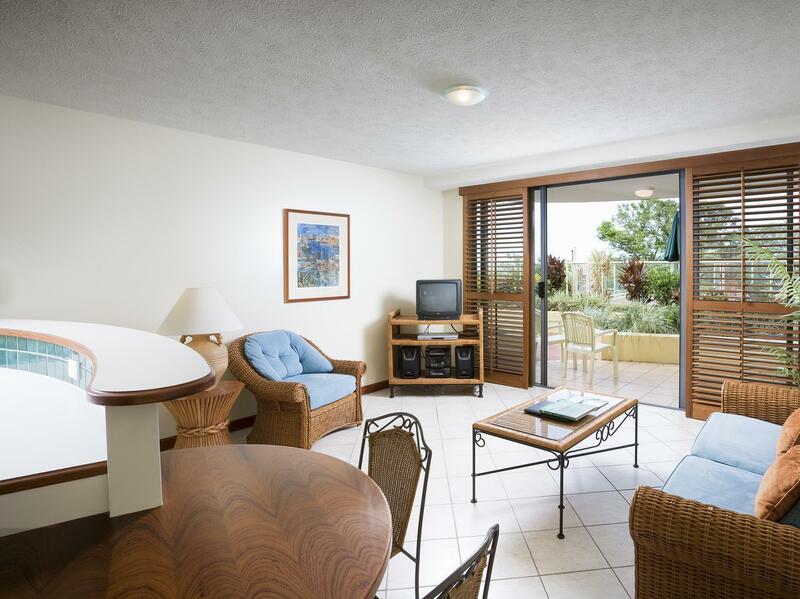 The location is centrally perfect, the room was clean, large with all amenities and an excellent view out over the water. Highly recommend it and we would definitely stay here again if we were to travel to Cairns again. We did not use the food/dining area as we ate out every night and so we are unable to score that area accurately. 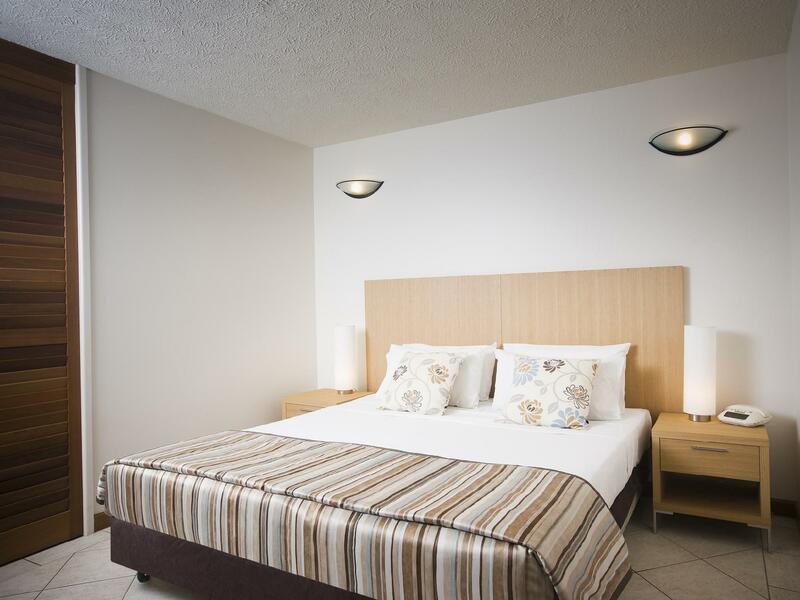 The hotel is well located and offers excellent views over the prominade, sea and harbour. We really enjoyed having drinks on the balcony in the evenings, watching the boats come into the harbour. At sunset one can see many flying foxes (huge bats) flying past. The colourful paradise lorikeets also frequents the trees opposite the hotel. This hotel must be the most centrally located hotel in Cairns. The receptionist was most friendly and helpful. We were on the fith floor and though the restaurants and night markets are below the hotel, we did not find it noisy at all.